In his first major book, Lotto draws on over two decades of pioneering research to explain that our brain didn't evolve to see the world accurately. It can't! 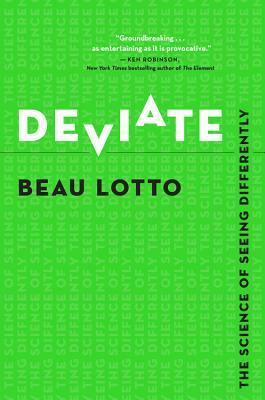 Visually stunning, with entertaining illustrations and optical illusions throughout, and with clear and comprehensive explanations of the science behind how our perceptions operate, Deviate will revolutionize the way you see yourself, others and the world. Beau Lotto is a professor of neuroscience, previously at University College London and now at the University of London, and a Visiting Scholar at New York University. His work focuses on the biological, computational and psychological mechanisms of perception. He has conducted and presented research on human and bumblebee perception and behaviour for more than twenty-five years, and his interest in education, business and the arts has led him into entrepreneurship and engaging the public with science. In 2001, Beau founded the Lab of Misfits, a neuro-design studio that was resident for two years at London's Science Museum and most recently at Viacom in New York. The lab's experimental studio approach aims to deepen our understanding of human nature, advance personal and social well-being through research that places the public at the centre of the process of discovery, and create unique programmes of engagement that span the boundaries between people, disciplines and institutions. Originally from Seattle, with degrees from UC Berkeley and Edinburgh Medical School, he now lives in Oxford and New York. proved himself to be an immensely engaging and daring populariser of science. reality, to recognize that others may surely have a different interpretation. proposition of how we can go beyond our current ways of seeing. that reality is something we create in our heads-I'd up my medication. lives a masterpiece rather than a 'been there done that' cliché. "—Ruby Wax, OBE, comedian, actress, mental health campaigner, and bestselling author of How Do You Want Me?